Riot Games has released the spotlight video for upcoming champion Rengar, the Pridestalker. The video highlights Rengar’s abilities and strategies you should use when playing him. ?Described as a melee, assassin, fighter, and jungler, Rengar uses a unique Ferocity mechanic. His basic abilities build Ferocity which, when full, deals significantly more damage with his next basic ability. ?In addition, his Bonetooth Necklace is a unique item available only to Rengar. This item grants bonus attack damage and gains stacks with kills and assists (and loses them with deaths). As he reaches certain stacks he gains bonus effects like movement speed, armor penetration, and increased leap range. Unseen Predator (Passive): While in brush or stealth, Rengar will leap at the target when using his basic attack. Rengar builds 1 Ferocity with each ability he uses on enemies. When reaching 5 Ferocity, Rengar’s next ability becomes empowered, granting it a bonus effect. 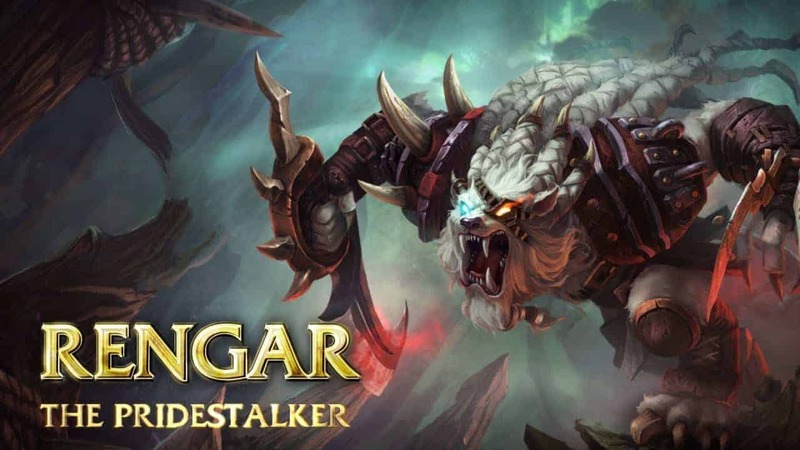 Savagery: Rengar’s next basic attack deals bonus damage and grants him increased Attack Speed for a short duration. Ferocity Bonus: Rengar deals enhanced damage and his Attack Speed bonus increases. Battle Roar: Rengar lets out a battle roar, damaging enemies and gaining bonus Armor and Magic Resist for a short duration. Ferocity Bonus: Rengar heals himself for a large amount. Bola Strike: Rengar throws a bola at his target, slowing them for a short duration. Ferocity Bonus: Rengar roots the target. Thrill of the Hunt (Ultimate): Rengar activates his predatory instincts, stealthing and revealing all enemy champions in a large radius around him. He gains Movement Speed and rapidly generates Ferocity while stealthed.